The only 5* luxury hotel within the old walls of the city of Siena, the Grand Hotel Continental is an architectural jewel of exclusive luxury in the medieval heart of the ancient city. History and art are an integral part of this magnificent 17th Century building, also known as Palazzo Gori Pannilini and a wedding gift from Pope Alexander VII to his niece, Olimpia. 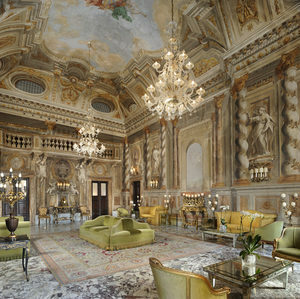 The frescoes are grandiose, the furniture is priceless, the marble is refined and the atmosphere is so romantic that throughout the centuries, it has won over the hearts of a truly elite clientele. Young aristocrats stayed here in the 1800’s, as did Queen Margaret of Savoy and German statesman Horst Köhler as well as many modern celebrities including Dee Dee Bridgewater, Dario Fo, Mario Botta, Andrea Bocelli and Daniel Craig. 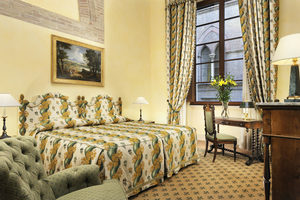 Grand Hotel Continental is in the heart of Siena, between Piazza del Campo and Piazza Salimbeni, just a few steps from the Duomo and close to all of the city’s most important monuments and shops, bars and cafes. Ristorante Sapor Divino offers a rich selection of exquisitely revisited Tuscany dishes and the wine cellar, carved into the tuff base of the medieval tower is a fascinating place to sip wines from some of the region’s most important estates. 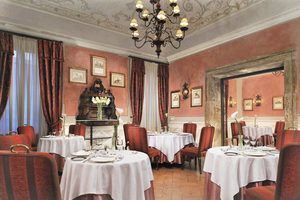 The elegant Sala Gori and the refined inner courtyard with its glass cupola also offer delightful meals. It will only take one night at the Grand Hotel Continental for you to be won over by the centuries of history, art and luxury that grace it. The hotel’s guest rooms and suites are the fruit of talented artists, craftsmen and interior designers who have over time embellished these spaces with frescoes, precious paintings, silver inlaid mirrors, silk, Chinese porcelain lamps and marble and travertine bathrooms. Room grades range from Classic to Deluxe suites.